Those of you who've met me in person definitely know that I enjoy experiencing good food of all sorts ... particularly that found in small towns a long ways from anywhere. 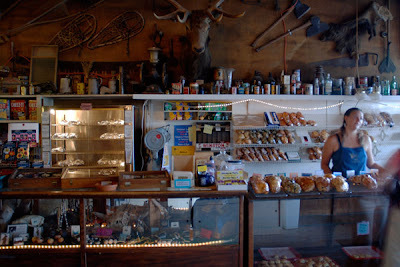 So I feel qualified to state with some certainty that this photo shows the sales counter of the very best bakery in Montana! This is the mercantile in the tiny community of Polebridge, Montana, a few miles past the end of the pavement in the remote North Fork country a little west of Glacier National Park. They make exceptional cookies and amazing breads, and the little Northern Lights Saloon next door is one of the tastiest and most atmospheric dinner places I know. Last summer I made a one-day, 600-mile roundtrip drive to Polebridge just to buy some of those cookies, and I'll almost certainly do it again. The memories this photo evokes made my mouth water, all the way here in Hawaii! How I hope we make it to Polebridge this summer!